President Donald Trump has signed a new bill into law to increase punishments for miscreants who damage or destroy the properties of churches or religiously affiliated organizations. Introduced by Utah Republican Sen. Orrin Hatch last May, The Protecting Religiously Affiliated Institutions Act of 2017 amends the federal criminal code to "broaden the scope" of what is considered prohibited when it comes to intentionally defacing, damaging or destroying religious property. The law also increases a criminal penalty for actions that result in the damage or destruction of religious property that exceeds $5,000 in damages. Such violations are punishable by a fine and prison term of up to three years in prison. Additionally, the bill broadens the definition of "religious real property" in the U.S. Criminal Code so that it not only protects the property owned by churches but also "real property owned or leased by a nonprofit, religiously affiliated organization." The legislation clarifies that threats to destroy properties of religious organizations are a violation of federal law. In era of contentious partisanship, the bill received bipartisan support. Hatch worked with the bill's co-sponsor California Democrat Sen. Dianne Feinstein in drafting the bill. The bill was also co-sponsored by Sen. Amy Klobuchar, a Democrat from Minnesota. From Hatch's own party, Republican South Carolina Sen. Lindsey Graham also co-sponsored the bill. The bill was sent to the president's desk last month. "Crimes targeting religious institutions pose a danger to the religious freedom and security of all Americans," Hatch said in a statement Tuesday. "I am proud to sponsor this bill that will protect houses of worship and affiliate community centers. These attacks are inexcusable. I want to thank my colleagues in both the House and the Senate, as well as the President, for working swiftly to sign our legislation into law." When Hatch first introduced the measure last May, he cited past mistreatments of early members of the The Church of Jesus Christ of Latter-day Saints and more recently, bomb threats against Jewish community centers. Hatch cited a report from last year indicating that over 100 bomb threats had been made against Jewish community centers in recent years. Additionally, dozens of headstones in Jewish cemetaries had been toppled in different incidents last year in two separate cities. "In recent years, we've witnessed an alarming upsurge in threats of violence made against religious institutions," Hatch said last year. "I've long held that an attack on one religion is an attack on all, which is why I have worked tirelessly to strengthen religious liberty protections for people of all faiths." 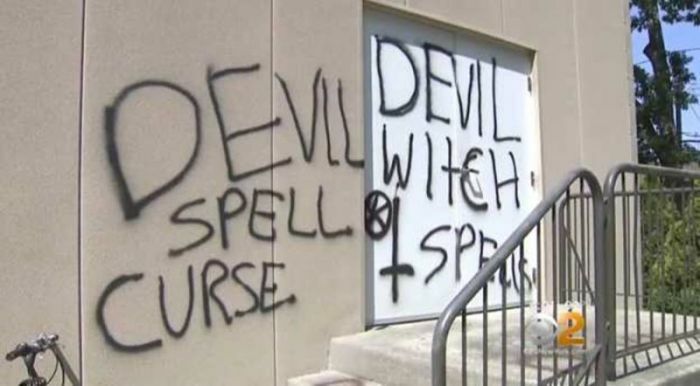 Local news outlets regularly cover the numerous instances in which religious institutions of affiliated organizations have their buildings defaced or damaged. Last month, the Muslim community in Austin, Texas suffered a series of vandal attacks. The North Austin Muslim Community Center in Austin, Texas was vandalized overnight on Sept. 2 when it had its front doors and windows broken while vehicle tires in the parking lot had been slashed. The attack was followed by another tire slashing on a van used by the center on Sept. 13. In March, the primarily-black Seed Planters Church in Henry County, Georgia was getting ready to open up its new location in McDonough, a primarily white area, when vandals kicked in a door and defaced walls and doors inside the church with spray paint. Last year, a church in Wisconsin was vandalized with pro-LGBT graffiti. Last month, a pro-LGBT United Methodist Church in Florida had the sign in the front of its church spray painted over with the words "Gay Pastor." In April 2017, a Virginia man was arrested and charged with spray painting anti-semitic graffiti onto a Jewish worship center in Northern Virginia. Another theme is vandals damaging statues or other sculptures at churches and religious centers. In 2016, three statues were vandalized at a Catholic church in Vermont, including a statue of Mary that was beheaded.